A medium sized turkey leg, boned with all tendons removed, stuffed and rolled up with a couple of rashers of streaky bacon (the whole caboodle is available from our butchers’counters). 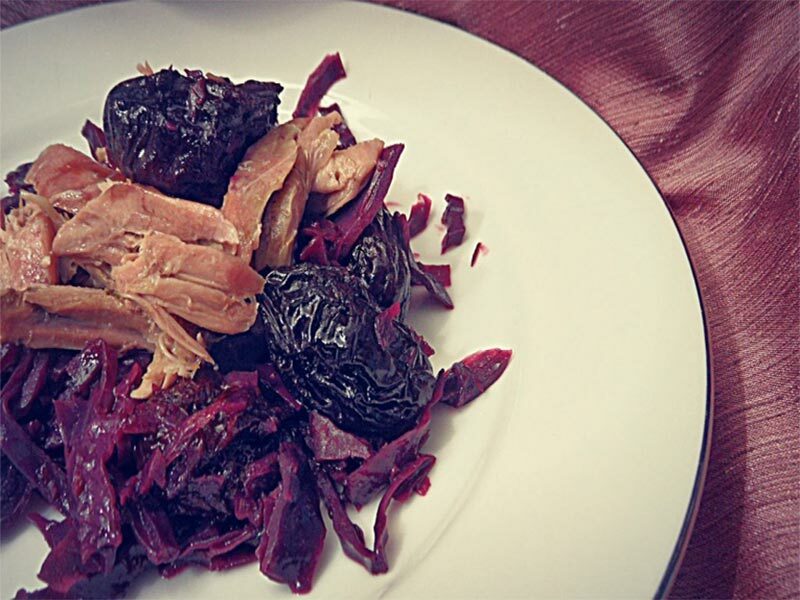 2Nigella Lawson's 'red cabbage cooked in the Viennese fashion' has virtually gone viral on the web with good reason. Mix a sieved tablespoon of flour with 4 tbsp of crème fraîche and a teaspoon of English Mustard powder (my addition) in a large bowl and mix in the red cabbage (a ladle at a time). Return it all to the saucepan and cook, on the hob, for another 10 minutes over gentle heat. Check the seasoning - hopefully the acidity of the grated apple will come through - and the cabbage will be lusciously creamy. Take out the turkey and allow to rest for a few minutes before carving. 3Chez Watson, bread sauce and potato crisps round off the meal, both for the carbohydrate element and communal dunking but it does make for a very messy plate. C'est la vie! !